I've been thinking alot about my post yesterday and how much I love moving and decorating! In no way am I sentimental with my homes, furniture anything materialistic sure I love my things but I love new things more I love turning old things into new again. I didn't learn this on my own I had a very exciting childhood and what mum likes to call "character building" I have moved 17 times lived in 19 suburbs, repeated living in the same home 2times, moved interstate 5times And been to 6 different schools and this isn't just the case for me but for all my siblings my childhood consisted of renovating, gardening, decorating and styling I learnt my skills from my Mum and we have the biggest passion for it! When I was younger it was all about getting bricks for Dads paths, buying ponds for Dad to make, painting the outside of our houses we had blue, yellow, maroon trimmings you name it we probably tried. people would cringe at the idea but honestly we received so many compliments for my mums choice of colors we always had the coolest rooms growing up I wish my mum pursued interior design or interior styling. Now that I'm older mum & I swap furniture, quilts, our ideas, where to find bargains, and even though she now lives in Canberra we are thankful for FaceTime for our house tours when we buy something new! Most people that know me think how horrible that would have been moving so much and changing schools but honestly I probably made more friends in a year then they have in their lifetime I find it so easy to make friends and I really appreciate my parents for giving us kids the knowledge we have especially when it comes to buying houses and their ideas on saving money to buy houses, renovate and make a profit. I appreciate my Dad for teaching me how to paint, use tools, build a path, stain a deck, garden, build a pond and seriously so much more (obviously these skills have become so useful and I can teach Dave how to be a handyman!) and Mum for teaching me so many crafty things she is so talented, colour schemes, styling tips and tricks, gardening, bargain hunting and to go with my gut instinct! It is so hard for me to stay in one place I get so bored and always want to change everything and let's face it buying new furniture all the time and moving can rack up the cost very quickly I thoroughly believe in DIY and love helping my friends out with projects and their houses etc.. This is why this time I know we need to save on moving costs till we are ready for the biggest project of my life in the next few years and what a great time it is to buy with how cheaps places are going up here!! So tell me how many houses have you lived in? Were your parents into renovating like mine? Do you love moving? 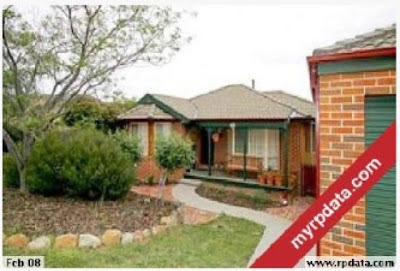 This was by far my favourite home we built I remember every weekend carrying so many bricks for my Dad to build the garage and the path out the back and Mum had so many roses out the front this is a pic after we sold it so its a bit blurry from the Internet.